In the Bible, the season of light (Gen. i. 5), lasting "from dawn [lit. "the rising of the morning"] to the coming forth of the stars" (Neh. iv. 15, 17). The term "day" is used also to denote a period of twenty-four hours (Ex. xxi. 21). In Jewish communal life part of a day is at times reckoned as one day; e.g., the day of the funeral, even when the latter takes place late in the afternoon, is counted as the first of the seven days of mourning; a short time in the morning of the seventh day is counted as the seventh day; circumcision takes place on the eighth day, even though of the first day only a few minutes remained after the birth of the child, these being counted as one day. Again, a man who hears of a vow made by his wife or his daughter, and desires to cancel the vow, must do so on the same day on which he hears of it, as otherwise the protest has no effect; even if the hearing takes place a little time before night, the annulment must be done within that little time. The day is reckoned from evening to evening—i.e., night and day—except in reference to sacrifices, where daytime and the night following constitute one day (Lev. vii. 15; see Calendar). 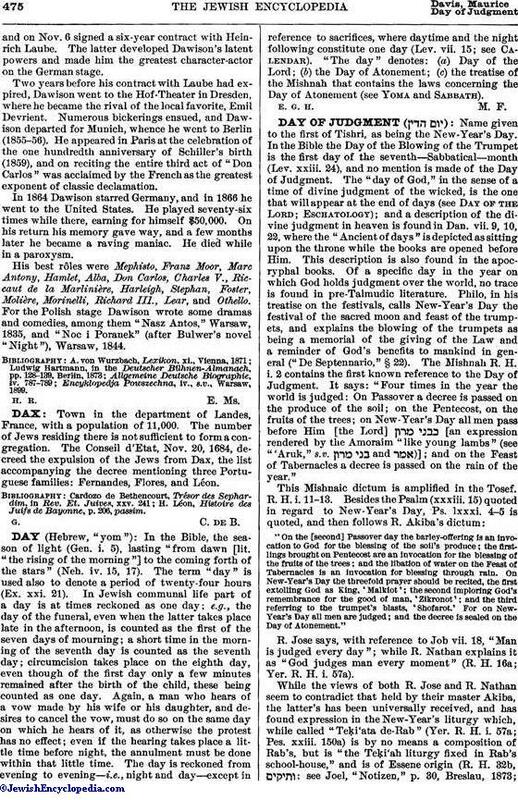 "The day" denotes: (a) Day of the Lord; (b) the Day of Atonement; (c) the treatise of the Mishnah that contains the laws concerning the Day of Atonement (See Yoma and Sabbath). E. G. H. M. F.